From day one of being in private practice, Dr Lauren Kyle knew that she had made the right decision. 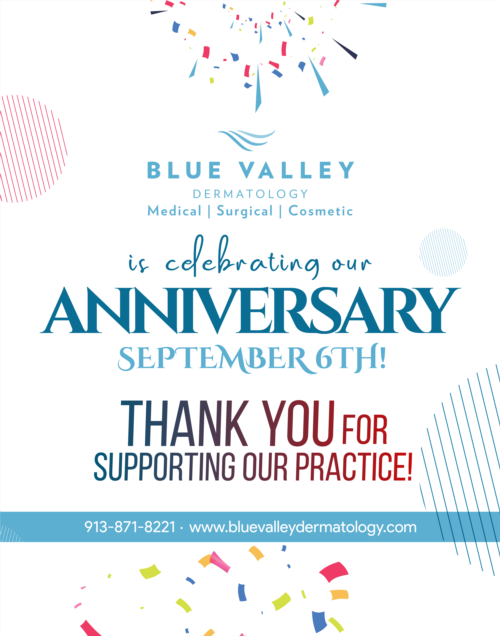 The overwhelming support she has received from patients, colleagues, neighbors and friends has made Blue Valley Dermatology one of the fastest growing medical practices in Johnson County. "We went from seeing 50 patients our first week to seeing 50 on an average day." said Dr Kyle. The practice has increased the available appointment times to accommodate the end of year rush that most medical specialties experience. Many patients wait until the end of the year to make appointments with a specialist such as a dermatologist. Dr Kyle warns patients not to wait too long though. Appointment slots fill up fast, as the demand for dermatologic care is in high demand. Dr Kyle explains the fall is especially busy in the world of dermatology. "In the fall, patients who have reached their deductible tend to schedule more appointments because they have reached their out of pocket maximums. We know this is going to happen so we have have increased our staff and expanded our schedule to accommodate more patients." The average wait time for a dermatology office is close to 30 days in some areas. Having a new practice open up with next day availability is big news for patients seeking treatment. "Our goal is to avoid making patients wait weeks to get in to see us. Anyone who is dealing with an accute skin condition needs relief fast. We hold a handful of appointments aside for just this reason." Practice Manager, Tom Tkachuk added. One thing for sure is that Blue Valley Dermatology is focused on providing high quality patient care with the shortest wait times.